Congratulations Connie, well deserved. Yet another stunning creation and love the gorgeous image. Lovely card - congrats on the DT position. Wonderful creation! And totally with you for the using up the scrap pile... My box of the solid colors can't close anymore... and huge pile on top!!! I need to do smaller cards to use it up lol So glad to see you on the team!!! 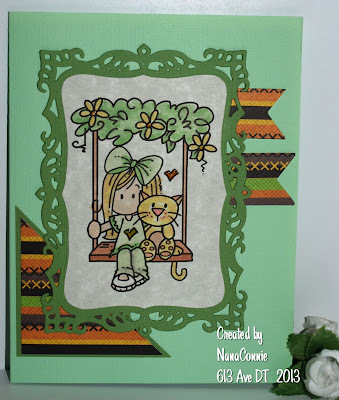 Love your card and love that sketch too!! Am going to try and play along this week! Love that little Bugaboo image and it's framed out so pretty! Congrats on the new DT - know you're going to have so much fun and they're getting one of the best! I love your card using my sketch! What a sweet image by Bugaboo. Great colors too! NC, love this card. The frame and the design elements work so well together. What a darling image. Congrats and welcome to the team. Here we are again together on another DT. Your creation is delightful, great take on the sketch. So sweet and Congratulations...thanks for joining us at Cupcake! Congrats on your DT appointment, Connie! Your card is SO pretty!! Connie, a huge congrats on your new DT position. Your card is adorable...so is the image. Have fun with this new group. Congrats on the DT. The sketch is awesome and you really did a wonderful job with the interpretation. I'm too literal too. Bugaboo was my first gig as a DT. I still love those characters and gosh...I don't remember this one. Sooo sweet! Congrats on the dt! Cute sketch, and you did a super job with the image! Sweet card! Great use of the sketch! So satifying using up all those scraps isn't it! This is gorgeous, thanks for joining us over at Sarah Hurley this month. Congrats Connie on the new DT spot.Loving the card and your take on the sketch, Cute image! Beautiful card but more importantly congrats on your coup over at 613! They are lucky to have a lady with your talent on their team.